As I explained to Debra at Moon in Gemini, I am not a fan of the sobby, tearjerker trope. However, even one of my books, dedicated to movies for guys, says that Old Yeller is a classic coming of age movie that should not be missed. I admit it, however, I only recently watched it. But I read the novel by Fred Gipson when I was a wee lad. So I knew going in how it ended. The movie was directed by Robert Stephenson. You know, I wasn't ALWAYS a director type person. (I am now. 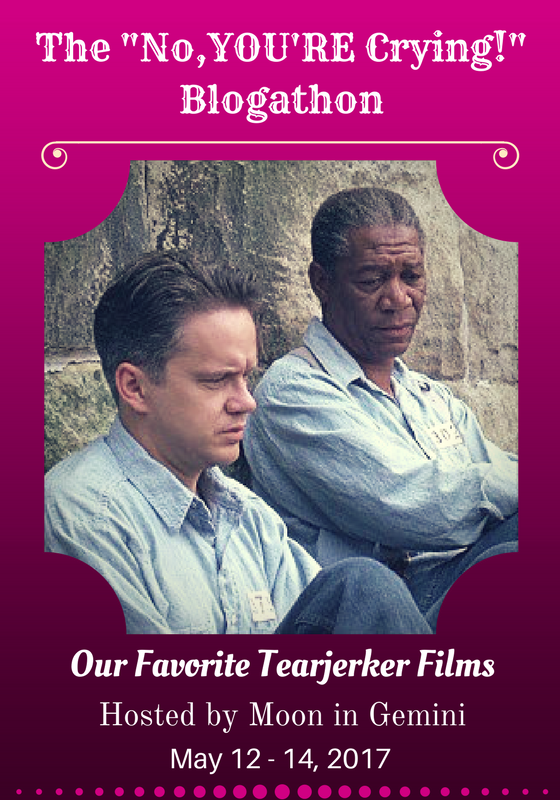 See our Favorite Director Blogathon if you feel the same way). It was only after I turned 18 that I started paying attention to whose name was listed last in the credits. But after looking at Stephenson's output as a director, much of it under the Disney logo, I find that some of my most beloved movies of childhood were directed by him: Blackbeard's Ghost, The Absent-Minded Professor AND Son of Flubber, Bedknobs and Broomsticks, The Love Bug AND Herbie Rides Again. He also directed Mary Poppins, not one of my favorites, but still a classic. Remarkably, there are only 7 characters in the entire movie (8 if you include Spike, the dog that portrayed the title character). That's pretty rare in itself, but each of these actors and actresses were pretty good at their craft. You get Dorothy McGuire as the mother. She was the veteran, so to speak, having been in movies longer than anyone with the exception of Jeff York (as the neighbor, Mr. Searcy) Fess Parker had been around for a few years, but it was Walt Disney who made him a star. 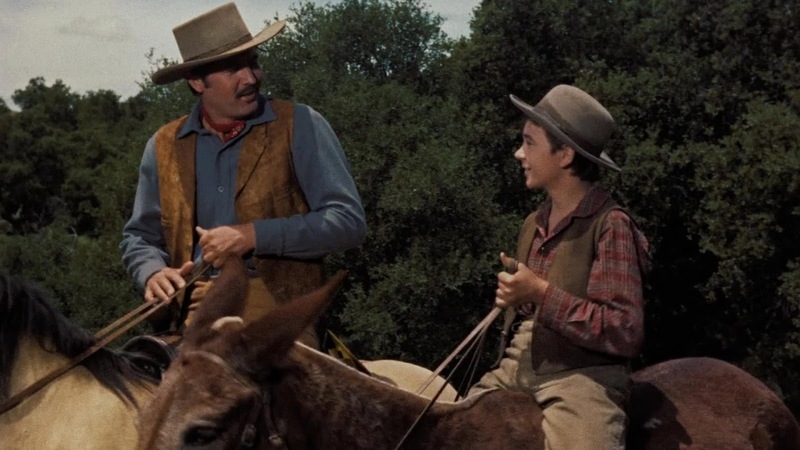 This was an early title role for him (before his famous roles as Davy Crockett and Daniel Boone, for Disney). 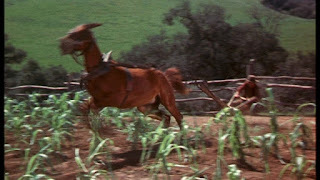 Chuck Connors, who had a brief appearance as Mr. Sanderson, the original owner of Old Yeller, had just left a career in baseball (did you know he played both in the MLB and the NBA? I didn't. ), and went on to TV fame from here as Lucas McCain on The Rifleman. 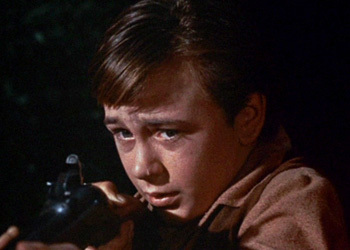 Tommy Kirk and Kevin Corcoran got the roles as brothers (and went on to play the same brothers in the sequel to this movie, Savage Sam, as well as playing brothers in a few other Disney movies). While Kirk went on to a career as a star in movies (including a fond favorite of mine as one of the Martians in Mars Needs Women), Corcoran pretty much ended his career as an actor when he left the industry to attend college, but came back and continued to make movies, only this time behind the camera as assistant director in hundreds of TV shows. Rounding out this cast was Beverley Washburn, as Searcy's daughter, Elizabeth. Washburn says in the features section of my DVD that she was up against nearly every female star of the Mickey Mouse Club and that she was proud the producers honored her with the role. 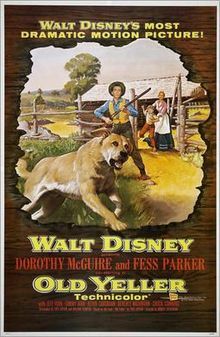 A note on the film: The movie poster and the credits feature Fess Parker as one of the stars (in fact, his name appears second in the list of credits), but Parker's character is only on screen for the first 10 and the last 5 minutes of the film. The stars are really Dorothy McGuire as the mother and Tommy Kirk as the young Travis, as well as Kevin Corcoran as Arliss. Spoiler Alert! It would be impossible to explain why I classify this movie as a "tearjerker" without revealing the denouement. So be forewarned. 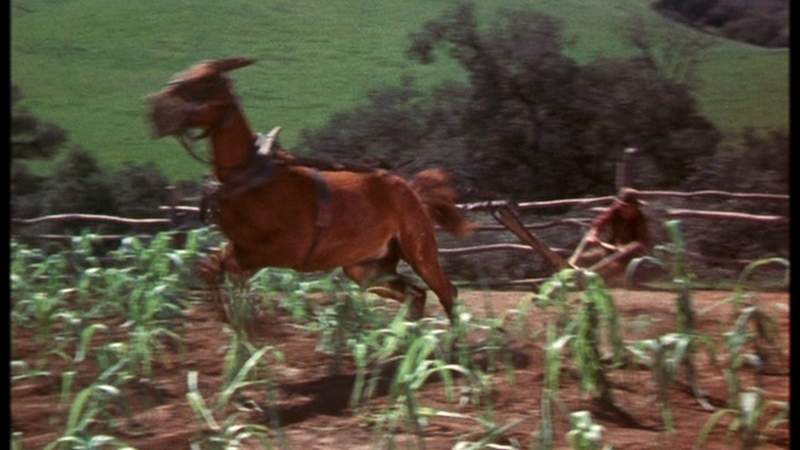 In Texas, circa post Civil War, Jim (Fess Parker) and his wife, Katie (Dorothy McGuire) are running a farm. Jim has to leave to help run a conglomerate group of ranchers (which we don't see) run a herd of cattle up to Kansas. He leaves his oldest boy, Travis (Tommy Kirk), in charge. The next day a stray dog shows up and creates havoc, scaring the family mule which knocks down several yards of fencing. Initially, Travis is angry and disgusted with the mongrel, but his brother, Arliss (Kevin Corcoran) takes an immediate liking to the mutt. Despite Travis' objections, mom allows Arliss to keep the dog. Named Yeller (or Old Yeller), more because it is yellow than because it makes a yelling noise, the dog does a few things, including stealing a rack of meat hanging on the porch, that puts him on Travis' bad side. But Arliss is protective of Yeller. Arliss is a spoiled brat in some respects. This being Disney, you wouldn't see Arliss taken out to the woodshed, although in real life in the late 1860's, he probably would have visited that locale several times. Travis eventually grows to respect Yeller for his bravado and his gusto, and even gets him trained to be a good farm dog. Along the way Travis eventually grows to love the dog, and so, its not surprising that, even though initially Yeller is Arliss' dog, Travis comes to consider him his dog. 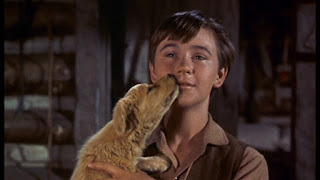 When Mr. Sanderson (Chuck Connors) appears on the scene to claim his dog (it actually was Sanderson's dog in the first place), Arliss becomes irate and thinks Sanderson is stealing his dog, but this being Disney, instead of going away, Sanderson makes a trade with the boy. Interestingly enough, at this point, although Travis respects and loves the dog, he is willing to let Sanderson take what is rightfully his. 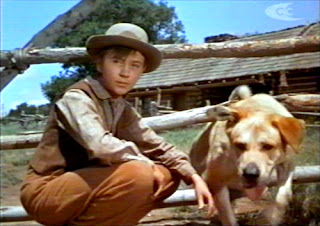 Travis claims towards the end that Yeller is his dog. To wit, when Travis and Yeller go hog hunting, Travis accidentally falls from the tree he is in. He is attacked by the wild hogs, and Yeller is seriously hurt by the hogs trying to defend him, Travis puts Yeller in a safe place and goes to try to get help. His mother insists that his, Travis', injury is too serious to go out, but Travis defies his mother to go retrieve Yeller. He insists that he promised the dog he would return, and since it's "my dog", he has to keep his promise. Later, after Travis is recovering from his attack by the hogs, Elizabeth (Beverley Washburn) tries to give him a puppy, a member of a litter delivered by her dog and fathered by Old Yeller. But at this point Travis has come to consider Yeller his dog and rejects the puppy, to the disappointment of Elizabeth (who apparently has her own "puppy love" for Travis). She gives the puppy to Arliss, and Arliss instantly transfers his ownership rights to the puppy. 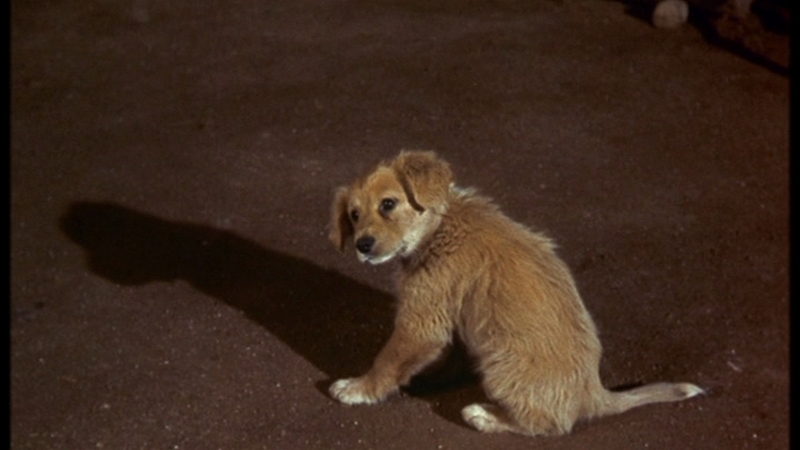 When Elizabeth and mother are attacked by a rabid wolf, Yeller comes to the rescue. 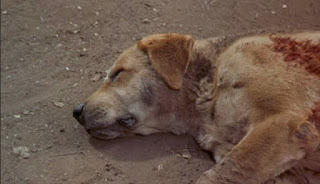 Travis eventually shoots the wolf, but not before Yeller has been bitten by it. Mother insists on what has to be done, but Travis' love for the dog makes him refuse to see the truth, until its almost too late. 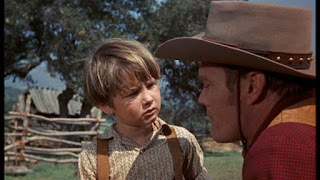 Yeller does become rabid, and Travis tells his mother that he, Travis, must be the one to shoot the rabid dog, because after all, "Yeller is my dog". And I defy even the hardest, most cynical person to not get teary-eyed when Travis pulls that trigger. 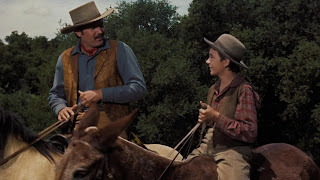 Papa returns the next day, having been away the entire time that Yeller was a member of the family, and gives Travis some Disneyesque advice on how to cope and continue on. The movie gives new hope for Travis as it is revealed that the puppy is just as rambunctious and reckless as Yeller was when he first appeared at the farm. Thus giving an indication that Travis may have a new outlook on life, helping make the puppy a useful farm critter. Dry your eyes, folks, before attempting to drive home. 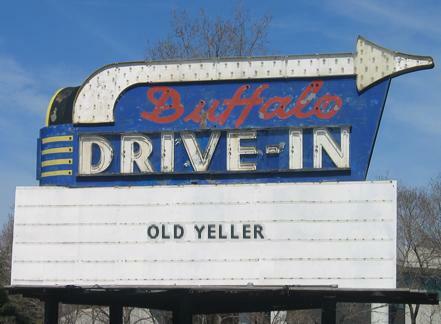 And we'll see you next week at the drive-in. This movie made me cry so hard the first time I saw it, and it still brings a tear--even just reading about it! Thanks for the memories! Not sure if I cried when I read the book... that was over 40 years ago. But I did well up when I watched the movie for the first time (just last month) and I knew what was coming. Thanks for reading, Chris. I love that stupid movie and that purty yeller dog. I'm kinda mad at you right now though. You went and made me cry. Well, that was the whole point of the "tearjerker" aspect wasn't it? :-D Thanks for reading. I didn't care for most of the movie, except that ending. Wow, it knocked me down and I ahd to cry in fetal position. I didn't realize Chuck Connors played in both the NBA and the MLB! That is remarkable. He didn't play a full season in the NBA, but he was on the roster for the Boston Celtics in 1946. He left to play baseball instead before the end of that season. Hope you get a chance to see the movie soon. Thanks for reading. I have never seen this movie only because someone spoiled the ending for me. When I was little I saw another pet film with a tragic ending (Ring of Bright Water) and my mother had to drag me out of the theater because I was screaming. I'm glad you chose it, though, because it's such a classic. Thanks so much for joining the blogathon! I take it you never read the book. Sometimes that can be a spoiler. I read the book when I was 8 or 9. And yet I still watched the movie. (albeit 40+ years later...) Thanks for reading.